How much do you know about Singapore? Do you know how did Roti John get its name and where is the last kampung in Singapore? You will be surprised at the number of such interesting tidbits and facts about Singapore from SG Tidbits 365, a Singapore Discovery Centre exhibition showcasing the many facets of Singaporean life. In line with this theme on rediscovering Singapore, the Singapore Discovery Centre is currently running an online SG Tidbits 365 contest where one can win exciting prizes (iPhone 3GS, Nintendo Wii, Holga Lomo camera and Capitaland Vouchers) by submitting a photo or video with bite sized captions to showcase an interesting or fun fact about Singapore. To participate, upload your photos or input the youtube URL of your video to SG Tidbits 365 website and tell your version of Singapore’s best kept secrets. There are no limits to the number of entries you can submit. Then get your friends to vote for your submissions. Voters also stand a chance to win Capitaland Vouchers so it is a win-win for you and your friends. Winners of the contest are determined by judges and the number of votes received at end of contest. Contest ends 31 December 2009 so don’t wait. 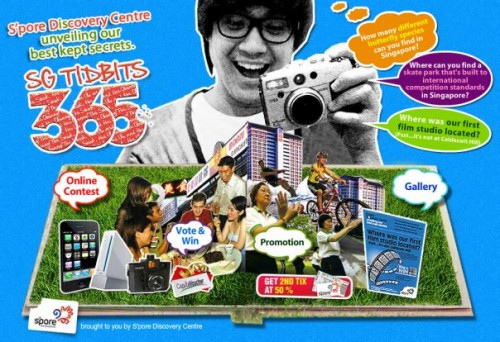 Go explore around Singapore for its best kept secrets, take a picture or a video of it and submit to SG Tidbits 365 for a chance to win an iPhone 3GS! should be interesting, but then again i like trivia!